Welcome to Christ Memorial Presbyterian Church (or as we like to call it: CMPC)! Are you looking for a community in which you (and your family) can nurture your faith and grow spiritually? You may have just found it! 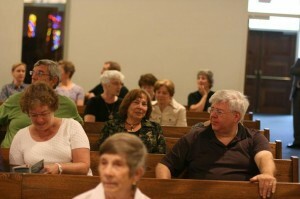 Christ Memorial Presbyterian Church has been a caring community of faith in Columbia, MD for over 50 years. Each Sunday we gather together to worship and celebrate what God has done, is doing, and will do in our lives and in this world through the person of Jesus Christ. At CMPC, we also offer worship, education, service, and fellowship opportunities throughout the week, and you are invited to join us! We would love to meet you and tell you more about what we are doing to grow ourselves, and others, to be better Christians. At CMPC, we believe that each person has been uniquely called to be part of what God is doing in this world, both here in Columbia and around the globe. This is why we have a number of different ministries and missions to address these various needs – everything from a daily preschool and a mid-week youth program to building homes locally for Habitat for Humanity and restoring homes in the Appalachian Mountains of North Carolina. We are a community of people on a journey of faith, discovering what it means to trust and follow after Jesus on a daily basis. At the same time we are learning how to encourage, support, and care for each other along the way. Is this something you feel God might be calling you to try? We hope so. Come and join us sometime soon.